Samaresh Majumdar’s novel Kaalbela (The Odd Hours), which was a fascinating time-capsule of the turbulent 1960's and 70’s Calcutta, remains both an exceedingly popular Bengali novel and a terrific work of art. Compressing a layered and dense book like that into a movie would have been a tough task for anyone. Never to shy away from challenge, Goutam Ghose did take up this arduous task; the end result, one must agree, is reasonably competent and satisfying. Parambrata Chatterjee, in a role any actor would give a limb or two for, plays the principal protagonist Animesh Mitra, an idealistic young guy from North Bengal who has come down to Calcutta to study Bengali literature. Unbeknownst to him, he lands right in the middle of a political hotbed. Over the next few years, he slowly gets indoctrinated into the ultra-Leftist ideologies, and becomes part of the student-led urban guerrilla movement by the name of Naxalism. He also finds love in the form of Madhabilata (very well played by Paoli Dam), a fiercely independent fellow college student, and it is her love that will keep him alive when his grand visions of an egalitarian, classless society get shattered into a thousand pieces. The film did seem a tad disarticulated at times (in need of better editing and bigger budget perhaps) and certainly not as emotionally resonating or gut-wrenching as the book, but I found this well-enacted film a laudatory effort on Ghose’s part nonetheless. Robert Siodmak made two of the greatest film noirs of all time, viz. The Killers and Criss Cross. He directed a few more commendable noirs too, making him a legend in this school of filmmaking. 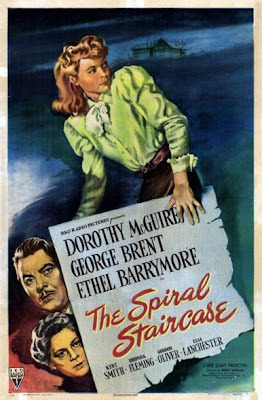 The Spiral Staircase, though not in the same league as the above two noir icons, nonetheless remains a taut and effective old-fashioned gothic thriller. A serial-killer is on the prowl in a small American town, and the only kinds of people that he is targeting are women with some physical handicap or other. Helen is a sweet-looking and mild-mannered girl, and lives in the house of a wealthy family comprising of a series of mysterious characters. Helen, unfortunately is mute as a result of a childhood trauma, and thus, as expected, becomes the latest target of the vicious killer. The villain’s identity is revealed in the end, but, like all classic “who is the mysterious killer?” films, not before a series of cat-and-mouse moments ensure the viewer’s suspicion keeps shifting from one character to the other like a game of musical chair. The film comprises of reasonably good performances by the cast and fine indoor shooting, with the tension-buildup nicely brought about. The script does at times border on the cheesy and melodramatic and the film has its share of clichés (perhaps because it was a studio-bound film intended to capture a wide audience base), the final product, despite its few flaws, does manage to stand on its own as a smart and interesting film. Sidney Lumet, right from his debut film 12 Angry Men to his swansong Before the Devil Knows You’re Dead, has made quite a few remarkable, no-nonsense movies on the flip side of the “American Dream” over the course of his long career. Lumet’s The Verdict remains a powerful courtroom drama as also an exceptional character study of an ageing, has-been man who gets a one-off opportunity to redeem himself and reclaim his dignity in the eyes of the world, and more importantly, in his own eyes. 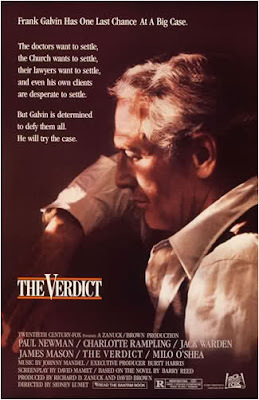 Paul Newman, in what might rank as one of his finest performances, played the role of the protagonist Frank Galvin. Galvin, an alcoholic Boston lawyer who’s hit the rock bottom both personally and professionally, goes against a mighty law firm representing a Catholic hospital in order to defend against various odds the cause of a woman who’s gone into coma upon wrong administration of anesthesia. On the surface the film might appear to be a classic underdog story, but thanks in large parts to the great script and Newman’s tour-de-force performance, it developed into something much more than that. Newman received excellent support in the form of Mickey Morissey as Galvin’s loyal friend, Charlotte Rampling as his deceitful lover, and James Mason as his high-profile rival. The best aspect of the movie remains the time and effort expended by Lumet in developing the characters and character dynamics, and in its exemplary pacing leading us to a quietly profound albeit understated climax. Khamosh, Vidhu Vinod Chopra’s sophomore feature film direction, is a film-within-a-film made in the tradition of a classic whodunit. A film-crew has come to the beautiful town of Pehelgaum (in Kashmir) to shoot a movie. Things however take a dramatic turn when a supporting actress (and a wannabe heroine) mysteriously commits suicide. In comes a military man who is convinced that the lady has been murdered, thus kick-starting a chain of events that results in a few more murders with the blame being serially shifted from one person to another. As the murky plot unfolds, we realize that hardly any character is capable of occupying a moral high-ground; rather, ugliness and deceit define most of them, irrespective of what their public veneers suggest. 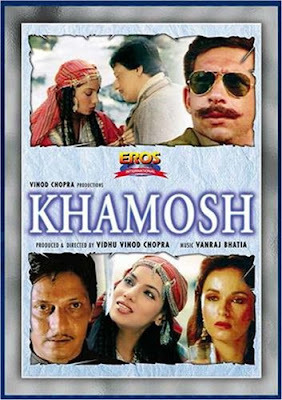 The movie boasts of a terrific ensemble cast – Naseeruddin Shah, as the no-nonsense military man who makes unraveling the killer his personal agenda; Amol Palekar, as a famous actor and a mild-mannered man; Shabana Azmi, as an award-winning actress and a somnambulist; Sadashiv Amrapurkar, as the director; Ajit Vachani, as the film’s lascivious producer; Pankaj Kapoor, as the producer’s alcoholic brother, to name a few. It’s not that the plot is completely bereft of discrepancies, but they never came in the way of my enjoying this delectably suspenseful and tightly structured murder mystery. 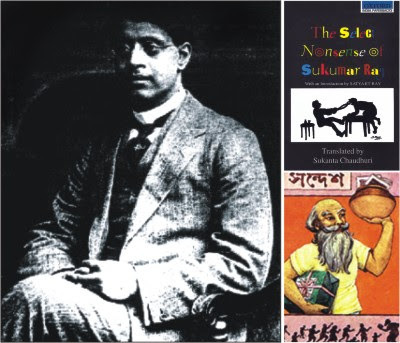 Sukumar Ray was a remarkable personality in the history of Bengali literature. Son of Upendrakishore Raychaudhury (a close friend of Rabindranath Tagore and a man with multifarious talents and achievements), he was an incredibly gifted man. One of the great humourists of the world, he remains the father of ‘literary nonsense’ in India and finds place in world-literature alongside the likes of Lewis Carroll and Edward Lear. His poems, stories and plays, which are filled to the brim with wit, absurdist and satirical humour, wordplays and ironies, and adorned with his wonderful illustrations, remain immensely popular among Bengalis to this day, though largely unknown outside Bengal. Interestingly, his creative bent aside, he graduated in both Physics and Chemistry (from Presidency College), studied printing technology from England, was a pioneer in photography and lithography, regularly dabbled in essays on science, ran the magazine Sandesh started by his father, participated in reformist activities, founded the Nonsense Club, among others! Made by his son Satyajit Ray in order to commemorate his birth centenary, this crisp 30-minute documentary provides a fascinating portrayal of the man, his life (albeit a woefully short one as he died at the young age of 36), his priceless creations and his enduring legacy. 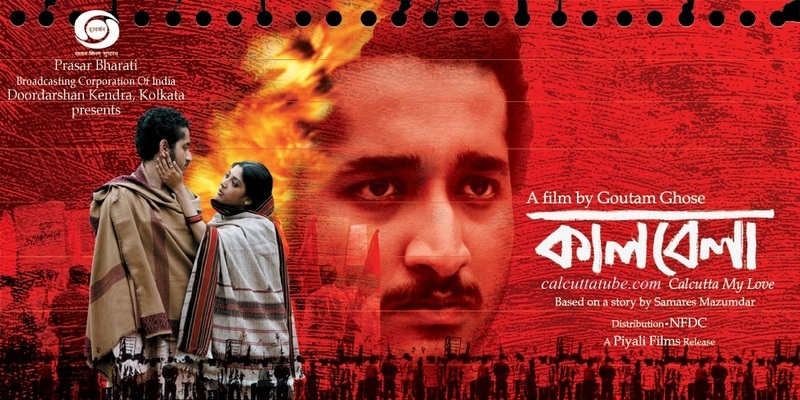 Brilliantly narrated by Soumitra Chatterjee, it features performances by some of the doyens of Bengali cinema (in the dramatized sections of his life), viz. Chatterjee, Utpal Dutt and Santosh Dutta. The documentary is funny, lyrical, informative and mournful in equal measures, making this heart-rending (and curiously nostalgic) account a loving tribute to the extraordinary genius of Sukumar Ray.